Perhaps you were one of the poets, or an audience member, at the recent SpeakEasy: Road Trip reading in Bellingham. Maybe you write about places you go or rely upon the wisdom of poets to guide you on your travels. In any case, the Huffington Post’s Peter Mandel wants to hear from you. While Mandel doesn’t mention submitting your own work, he also doesn’t say you should not. Visit his HuffPo article to find out how to send a poem — yours or otherwise. Saturday, February 9, 2013 ~ Another fabulous workshop to benefit the Contest. We’ll post additional details as soon as they’re available. March 1-31, 2013 ~ The Contest opens for submissions from Whatcom County poets of all ages. Tuesday, April 16, 2013 ~ If you love food and you love poetry, you won’t want to miss Taste for Poetry, the annual fundraising dinner extraordinaire at Ciao Thyme in Bellingham. Thursday, May 16, 2013 ~ Join the winners of the 2013 Sue Boynton Poetry Contest at the Cruise Terminal for one of Whatcom County’s most memorable and heartwarming poetry events: the Sue Boynton Poetry Contest Awards Ceremony. Additional details to follow. Contest guidelines will be posted as soon as they’re finalized. Many more local and regional poetry events on the NW Lit Events page (updated daily!). Portrait of Blake, engraved by Schiavonetti after Phillips, 1808. Every spring, in a crescendo of creativity, Bellingham Repertory Dance and Chuckanut Sandstone Writers Theater collaborate on Phrasings in Word + Dance. If you’ve attended (or participated in) previous shows, you know what a treat this is; if not, you’ve missed something fine. The call for poets for Phrasings 2013 is now open. Submissions must be received on or before Saturday, December 8, 2012. Poets are invited to submit either a written piece OR a proposal to collaborate. Read and follow (carefully) the guidelines here (don’t fret about the post date on the blog; the information is current). Art Kitchen and the Olympia Poetry Network present some of Olympia’s most dearly loved poets, including Barbara Gibson, Bonnie Jo Jones, Elizabeth St Louis, Emily Van Kley, Grayce Forsythe, Jeanne Lohmann, Madison Bennett-Ponsford, Mimi Alcántar, Sandra Yannone and Terri Cohlene, plus the piano musings of Ami Aika. 6:30pm, Friday, November 30, 2012, Traditions Café. The cursor flashes on the blank screen. The clock ticks. You wait. You wait. If you’re ready to stop waiting, ready for a little writer-assist — or a little writer-fun — hasten yourself over to Language is a Virus. There you’ll find writing games, exercises and articles, poetry generators (!) and NaNoWriMo tools (sure it’s almost the end of November, but it’s never too late…and you’re going to keep writing, right?). They even have a Pet Name Generator! Surely you can find something on this crazy site to prompt a poem. But, in case Language is a Virus fails to eject you from inaction, you could have a look at other posts tagged poetry prompts. 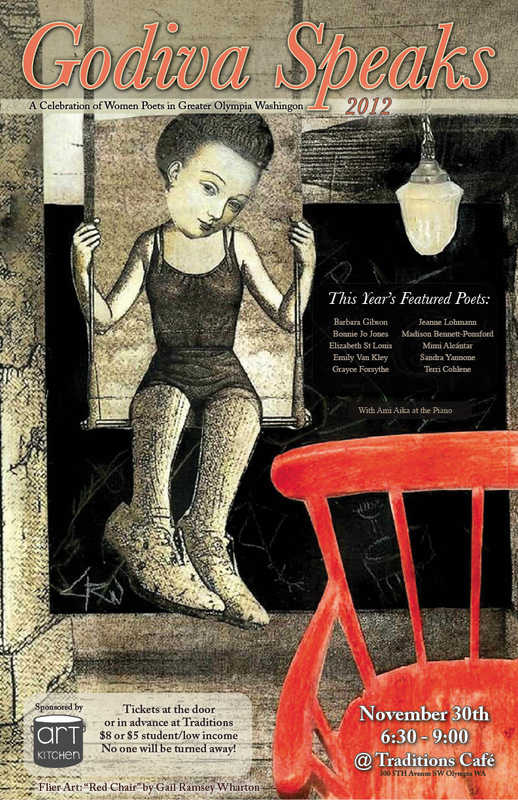 Fantastic article by Dean Kahn on the local poetry scene in Whatcom Magazine, out today. Go get it!